THOMAS POWNALL. Map. 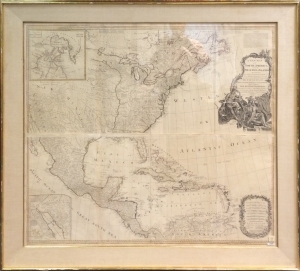 A New Map of North America with the West India Islands, divided according to the Preliminary Articles of Peace, Signed at Versailles, 20, Jan 1783, wherein are particularly Distinguished The United States, and the Several Provinces, Governments &ca which Compose the British Dominions, Laid down according to the Latest Surveys, and Corrected from the Original Materials of Goverr. Pownall, Membr. of Parlimt. London: Laurie and Whittle, 12th May, 1794. Large engraved map with contemporary outline coloring, on 4 sheets joined to approx. 47 x 43 in. With elaborate figural title cartouche of a Native American family group, additional cartouche and inset maps of Baffin & Hudson’s Bay. Based on Bowen & Gibson’s 1755 Treaty of Paris map detailing the end of the French and Indian War. Several articles of the treaty are engraved in the map’s blank ocean areas. A few short marginal tears, light toning.